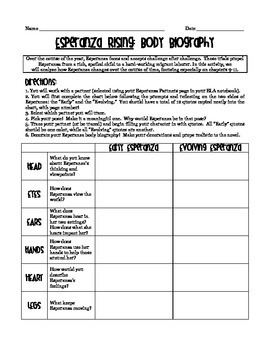 A fun alternative to a big report that I use with Esperanza Rising. Students work in small groups to trace out a full sized Esperanza character, and full her silhouette in with well-selected quotes that describe and define her as she grows and changes over the course of the novel. A neat twist on characterization activities with an artistic flair. Directions and rubric included, as well as a brief written response! Please check out the rest of my Esperanza products.